1) The use of geosynthetic containers for disposal of dredged sediments - a case history, by C. Lawson, Hong Kong. 2) Woorim beach protection - chasing the tide sand filled tubes vs. sand filled containers, by Hornsey ,W., Australia. 3) Design and construction of coastal erosion protection groynes using geocontainers, Langebaan, South Africa, by James ,G.M., South Africa. 4) Geotextile tubes for protection of mangrove coast at Tanjung Piai Johor National Park, Malaysia, by Kam, S., Malaysia. 5) Duration of the geosynthetic container in actual sites, by Kohashi, H, Japan. 6) Response of a submerged geocontainer to an underwater explosion shock wave, by Tyagi, V.K, India. 7) Laboratory and field tests on a ballasted geocomposite filter for the stabilisation of the seabed in the Venice lagoon inlets, by Cazzuffi, D., Italy. The presentations in this session were mostly case histories from various countries and regions, in which geosynthetics could be well applied in the field of coastal engineering in the form of geotextile container, geotube and geo mattress. The primary points of these presentations and discussions were the advantages of geosynthetics selected to obtain better solutions in each specific local site condition compared to other conventional ones. The laboratory and field experiments and numerical analyses were also conducted so as to respond the requirements of more reliable performances and to develop more suitable materials and more effective design and construction methods. By the contribution of the interesting presentations on case histories and their discussions, we could recognize that the use of geosynthetics have been more actively and effectively conducted in many local region over the world for protection of shoreline and preservation of natural environment in the coast. In the session chaired by Dr. BHATIA 7 speakers presented an excellent balance of application oriented and lab-oriented topics. C. J. F. P. Jones showed theory and effective application of Electro-Kinetic-Geosynthetics (EKG), pipe type electrodes enable pumping off the water which is accelerated in its motion by applying an electrical potential. G. P. Karunaratne showed that the tensile properties of PVD-filters are essential for deep PVD-application especially for high speed installation. Damage during in-stallation by tearing the filter may cause failure. J. Yu reported on excavated PVD after years of service showing good mechanical and hydraulic behaviour compared with pristine PVDs. R. D. Böttcher had run long-term compressive creep tests on some types of geodrains and determined discharge capacity under the long-term pressure. Cuspated core spacers may have sudden collapse of the elements, which will not allow extrapo-lation of creep curves under stresses close to collapse stress. J. Müller-Rochholz highlighted the influence of filter deformation in short-term tests. After long-term tests in soil the influence of tensile creep of filters was shown on the discharge capacity of geodrains. D. T. Bergado showed improved effect of PVD if heat is applied additionally. C.-H. Lee determined the reasons for settlement delays applying PVDs in the devia-tion of perpendicular positioning the long PVDs (40 - 63 m depth). With increas-ing depth the deviation from perpendicularity leads to longer water paths causing delays in settlement. A vivid discussion completed a fruitful session. The chairperson of this session was changed to Dr. Neil Dixon from Dr. Delmas who was originally appointed chairperson of H-2 but unfortunately had to withdraw from the conference. 1)	"The use of electrokinetic geosynthetics (EKG) in enhanced performance of sports turf". Presenter: Lamont-Black, J. (Electrokinetic Ltd., U.K.). 2)	"Application used PVDs and GTX cushion to treat soft subsoil on expressway embankment". Presenter: Wang T. R. (Zhejiang University, China). 3)	"Soil improvement works at Changi East, Singapore". Presenter: van der Molen , M. (Ballast Ham Dredging / Van Oord Dredging and Marine Contractors, Singapore). 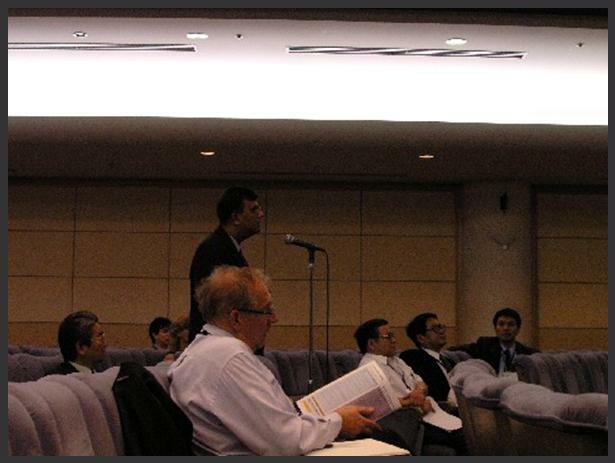 4)	"New generation of electrically conductive vertical drains for treatment of Singapore waste materials". Presenter: Leong, T.P. (National University of Singapore , Singapore). 5)	"Analysis of field application of electro-osmosis via electrically conductive drains for soft clay consolidation". Presenter: Chew, S.H. (National University of Singapore, Singapore). 6)	"Vacuum consolidation method applied to underwater mud improvement". Presenter: Takahashi, S. (Obayashi Corporation Technical Research Institute, Japan). 8)	"Use of geocomposite drain in soccer field in Brazil". Presenter: Santos, J.P.. (Maccaferri do Brasil Ltda., Brazil). Finally, Dr. Dixon issued brief closing remarks and closed the session on time. Technical session H-4 "Filtration" was held on Wednesday, September 20. At the start of this session, and by special agreement, a paper on geosynthetics terminology (see p.p. 431-434 of Conference Proceedings) was presented by R. Mackey. The paper was based on work done by ISO TC221 committee and issues on harmonization and unification were addressed. In discussion, arguments were presented on whether a product should be given a term based on its function or on some intrinsic property. Eight papers in the general area of filtration were presented during the session (see p.p. 553-572, 577-588, 597-600 of Conference Proceedings). The paper by Atmatzidis et al. pointed out that standard methods for geotextile pore size measurement yield different results and that the capillary flow method needs to be further refined. In discussion, both agreement and disagreement with some of the observations in this paper were voiced. The paper by Nunes et al. presented an application of image analysis to control the manufacturing process of nonwoven geotextiles in order to achieve random pore distribution. This technique was considered to be very promising. The papers by Chen et al., Kohata et al., Vidal et al., and Beirigo et al. had a strong laboratory experimental component and addressed various aspects of the filtration and clopping behavior of geotextiles. In general, the results obtained by the gradient ratio test (with or without modifications) or by using special experimental devices, depend on flow direction, overburden stress and overall gradient applied. The need for site specific testing was emphasized. It was also interesting to note that conventional design criteria may be replaced by rational criteria (based on a probabilistic approach). However, the limited number of geotextiles tested does not allow for generalized conclusions to be reached. In the paper by Marino et al. an experimental investigation was presented for an alternative application of nonwoven geotextiles as a filtration medium for the removal of suspended organic matter. Encouraging results were obtained indicating that optimum performance may depend on a combination of physical and hydraulic geotextile properties. In the paper by Zhang et al. a novel application of a porous foam filter was presented. This novel filtering medium was used to improve the performance and enhance the life-time of relief wells with significant success. Due to the time allocated to the paper on geotextile terminology and the short discussions between paper presentations, a general discussion at the end of the session was not feasible. The following six papers had been presented in this oral session. Fayoux, D. & Potie, G.
Kashiwayanagi, M., Sato, M. & Takimoto, J.
Fayoux, D. & Dewalque, N.
Wallace, R., Giroud, J. & Shanks, M.
Scuero, A. & Vaschetti, G.
Maruyama, N., Murayama, M. & Sasaki, F.
The durability of geomembranes for UV resistance was discussed. PVC geomenbranes are able to have a long lifetime in tropical climatic condition and the anchoring contributes to the lifetime of unprotected geomenbranes (#1). The behavior of complex geotextile geomembrane during tipping of the upper granular layers was also verified by large scale field tests (#3). The design of the sealing system with EPDM waterproofing sheets was verified from the results of the in-situ observation, theoretical method, laboratory experiment and numerical analysis. Other methods such as vacuum for restraining the swelling behavior of waterproofing sheet were discussed (#2). A case history in which the newly installed geomembrane liner was uplifted by entrapped air was discussed. It was indicated that the importance of construction quality assurance during the first filling of reservoirs lined with exposed geomembranes (#4). The new ICOLD bulletin on impervious geomenbranes for dam was introduced. The bulletin discusses the main issues of the presented state-of-the-art and provides some statistics as emerged from the database (#5). The design, structure and construction of a geogrid-reinforced counter-weight fill to increase the seismic stability of an existing earth dam were discussed. This project is the first application of reinforcing an existing earth dam by means of geogrid-reinforcement. It is expected to monitor the long-term post-construction behavior of the geogrid-reinforced steep slope (#6). 1 - The successful design and construction of a floating cover molasses storage reservoir for the TSB Malelane Mill in South Africa. The paper describes the design and construction of a floating cover molasses storage reservoir in South Africa. The concrete reservoir is lined with a CGL and a 1,5 mm thick HDPE Geomembrane. A system of floats and weights was designed for gas and rainwater removal by a Hi-Drain strip (Cuspated HDPE sheet). The reservoir is performing satisfactorily until now. Issues of concern during the operation have included the breeding of mosquitoes in puddles on the cover, which is a serious concern because the site is situated within a malaria area. 2 - On-going performance of a double LLDPE liner in a concrete lined reservoir with 200 column penetrations. The reservoir is a concrete liner with more than 200 internal columns supporting the roof. It was lined with double layers of LLDPE geomembrane liner in conjunction with other remedial works to solve a significant leakage through the joints and cracks in the concrete liner. The system has been working well and the leakage rates have remained within acceptable limits. The adopted penetration sealing system around the large number of columns was discussed by the audience. 3 - Earthen channel lining trials. The paper reports field trial applications of numerous different types of geomembrane and other liners in open channels on hot and arid area in Australia. The performance of these systems has been monitored yet since the main interest is in longer term performance of the system. The long term performance was the main issue of discussion. 4 - PVA textiles for the prevention of concrete exfoliation of constructions. A textile adhesion reinforcement method of concrete construction has been studied in Japan. The textile made by aramid fiber has been replaced by polyvinyl alcohol (PVA) fibers. The results show that the PVA nonwoven reduces the construction cost and the method could be applied by tunnels. 5 - Thermoplastic lined tunnels for transport and storage of waste and potable water. The paper discusses the implementation of thermoplastic lining in underground systems for storage and transport of waste and potable water in Singapore city. The results have shown that thermoplastic lining (HDPE geomembrane) is a practical and the best method for corrosion protection of concrete structure. The main motivation for the tunnel construction was the audience question. 6 - Adhesive waterproof sheeting for underground tunnels. A new technology to prevent the underground water leakage was proposed in Japan based on the development of an adhesive waterproof sheeting. This technology can be applied for not only open trench tunnels but also watertight NATM tunnels. By using the waterproof sheeting at the construction of underground structures water leakage troubles after construction are effectively prevented and repairing cost will be minimized. At the beginning of the session Prof. Jan Maertens , co- chairman of ISSMGE Technical Committee 17 on Ground Improvement thanked the organizing Committee for the opportunity that was given to present the activities of TC17. He also stipulated that there are many links between the fields of interests of the International Geosynthetics Society and TC 17. He expressed the hope that the initiative taken by IGS will be continued in the future. ---	deformations occur mainly during the construction stage (Nancey et al). ---	very high fills on very soft soils (Lee et al). -	Model tests can be used to check the effectiveness of the installation of a reinforced fill behind an U-shaped reinforced concrete wall in order to stop the deformations induced by daily and seasonal temperature changes. The many questions and comments after each contribution clearly demonstrated the interest of organising special sessions on case histories. There were seven presenters in this session. Four papers illustrated successful uses of geotextiles to construct a seawall in a port expansion project, a GRS-RWs at a waste landfill site, a reinforced slope on a highway, and the monitoring of three high structures. The other three papers examined and illustrated causes of failure of structures reinforced with geosynthetics. 1. Use of geotextiles to overcome challenging conditions at the seawall project in Port of Brisbane - K. H. HORNSEY. A: The wall was not designed by me. The main cause of failure was due to pile up soil 9m high on the wall that was beyond the designing condition. Q: How long to complete the construction? Q: Was there any cracks on the facing? A: No cracks were found. This was because the construction began after the settlement had completed. Q: How did you rate those causes in response to the failures of reinforced earth structure such as intense rainfalls, etc? A: This research was based on a qualitative study for each possible cause of the failure. For example, one particular reinforced earth structure failed after intense rainfall then we can reasonably infer that the failure was highly related with the intense rainfall. Q: What is the critical rainfall to trigger the failure of a reinforced earth structure? A: Based on Taiwan's experiences, accumulation over 300mm can be considered as a threshold value to trigger a slope failure. Q: Why improper planning is critical to the failures of reinforced earth structure? A: There are many species during the planning of a reinforced earth structure such as site investigation, function identification, and environment compatibility etc. In Taiwan, the designers often ignore the importance of planning such as site investigation. The ignorance of potential subsurface weakness such as geological weak formation will certainly cause serious foundation problems leading to service malfunction or incompetent design. Q: What are the units of parameters ƒ¿ and T in your proposed equation? A: These can be found in the referred paper I published. Q: The reinforced slope is 12m high and steep. Why was it constructed without tiers? A: The site is in the national reserved and the water source forest; its natural aspect must be preserved. The structures now constructed have tiers. Q: What is the length of time to get your conclusion? A: 10 years. Besides, we don't have that much of rainfall as in Taiwan. Like other session (case studies 1, 2, 4), many case studies related to reinforced slope and walls are presented in this session. There were 13 papers in this session, and 9 papers were presented by oral and 3 by poster. Some questions and comments were asked from the audience for each oral presentation. Most papers were introducing a case histories of current construction, field monitoring and design of reinforced slope, abutment and embankment on soft ground etc. The utilization of geosynthetics has already prevailed widely within many types of soil structure and this indicated that there are so many requirements or needs in practical field to apply geosynthetics to reinforce or enhance the stability the soil-structure which are going to be constructed under comparatively worse condition. Since, the design procedures in many country have already revised to performance design, it is necessary to evaluate quantitatively the stability or deformation characteristic of reinforced-soil structure, especially for the structure which is constructed under worse condition or which uses the inappropriate material such as construction waste soil. As Prof. Fumio Tatsuoka mentioned at the Closing Ceremony of this conference, lessons from case histories is essential for healthy development of Geosynthetics Engineering. What was the most remarkable in this session was that unsuccessful cases as well as many successful cases were presented precisely. The presented unsuccessful case was the collapse of high-raised reinforced soil wall and a lot of lesson was learned from this case. The Case histories of reinforced-slope and walls for successful and unsuccessful cases are including many lessons to both academic and practitioner. However, as mentioned by Prof. Ennio Palmeira at the Closing Ceremony, publishing case histories is not always important for professionals or not recommended in considering the company confidentiality policies. In order to make more cooperation between practitioners and academics, publishing case histories such as done in this session are very important and should be focused. The R-6 session was focused on the modeling and design of reinforced slopes and walls. The session was chaired by dr. A. Kollios and Prof. N. Moraci while the secretary of the session was Dr. T. Nakamura. In this section 12 papers were submitted (9 papers were presented orally) coming from 4 different continents: Asia (6 papers), Europe (4 papers); Oceania (1 paper) and Africa (1 paper). Referring to design methods Shinoda et al. suggested that the low-discrepancy sequence Montecarlo methods are accurate to calculate the limit state exceedance probability of internal failure. Qiao and Wang applied classical and generalized plasticity theory to evaluate the critical height of reinforced slope. Chirica and Baicu proposed a simple method based on the stress-strain relations for soil and for soil-geo-synthetic interaction in order to analyze the internal stability of reinforced structures. Kawamura et al. proposed a distribution model of confining effect in the ground considering pullout behaviour to be applied in the internal stability analyses. Referring to design parameters Freitag et al. focused on the design temperature effects, Haddad and Shafabakhsh showed the influence of uncertainty of design parameters on the internal failure and Liu and Li apply the least square principle to evaluate the design partial coefficients. Moraci et al. propose a useful design procedure for the design of geosynthetic soil structures. Yoo et al. presented the results of a numerical investigation of effect of foundation yielding on the deformation behavior of two tier geosynthetic reinforced modular block wall. Finally, Troskie showed the selection of geosynthetics in two different case histories. Many important topics were analyzed by the different authors, and the discussion during and at the end of the session was useful. The chair Prof. J. N. Mandal (India) and Dr. Kawamura (Japan) were running the session smoothly while me - as co-chair - was summing up and give this short session memo. Six papers were presented covering a wide spread of topics with regard to the session item. Paper 1 - "Confining effect of geogrid-reinforced soil linked with soil dilatancy and its application to practical design method" - was presented by Prof. Yasufuku (Japan) and provides about basic analysis focussing on soil mechanical principles to put it in design. Paper 2 - "Prediction of the deformation of a reinforces soil wall" - by Prof. Kaga (Japan) focussed on deformation - the key factor for performance using experimental data. Papers 3 - "The discovery of the true nature of compound failure without reinforcement pull-out: The chimeric failure type" - and 4 - "A new classification of reinforced soil failure modes leading to a new theory of reinforces soil and reinforces soil design - based on laboratory test apparatus and results from gravity-induced self-loaded failures of reinforced soil structures up to 1.8 m high" - were presented by Dr. Rankilor (United Kingdom) who is an enthusiastic major player in geosynthetics since a long time with strong focus on reinforcement. It's all about failure modes and failure types. He posted tension to pull out failure and underlined the internal tension failure as a fact. No Rankine stress field is to be assumed and issued the large factor of safety in dayly design leading to overdesign. Prof. Rao (India) presented paper 5 - "Behaviour of sand reinforces with coir fibres" - and spoke about performance and application of coir-fibres as natural material. Dr. Kim presented paper 6 - "A comparative study on design of geosynthetic reinforced modular block wall in tiered arrangement" - and refered to investigations using block model and specific about tier lengths. In discussion we heard about temperature impact by comparing assumed "boundary conditions" in different parts of the world. To sum up - overall we did hear presentations covering the important issue of reinforcement which have shown tremendous kind of developments during the last decade in developing design tools which are put in standards like the EBGEO in Germany. Total 9 papers were allocated to the R-8 session, and 5 papers were presented in the oral session. The first presentation was 'Stability analyses of geosynthetic-reinforced earth structures using limit equilibrium and numerical method' by Dr. Han. There was a question about the constitutive modeling in the analysis, and Dr. Han explained that they did not consider any volumetric change in the analysis. The second presentation was 'Parametric analysis of reinforced soil walls with different height and reinforced stiffness' by Dr. Bathurst. There was a question from the hall about the effect of compliance at the footing of the wall, and Dr. Bathurst explained that the effect of compliance is significant in many cases. Another question about the numerical modeling for the interface between geosynthetics and soil was raised, and Dr. Bathurst explained that he did not used any joint element at the interface because it is very difficult to get proper values for modeling in actual cases. The third presentation is 'Effect of valley on behavior of reinforced earth retaining structures' by Dr. Fan. He showed the importance of 3D analysis for earth structures in steep valley. There was a question about the possibility of a landslide at the site because the inclination of the valley is very steep; unfortunately, we did not have time to discuss the details of the site. The forth presentation was 'FE analysis on the rate-dependent behavior of model geosynthetic-reinforced soil retaining wall' given by Dr. Kongkitkul on behalf of Dr. Noguchi. Dr. Kongkitkul showed the simulation of viscous behavior of geosynthetic-reinforced soil retaining walls using a three-component rheology model. There was a question about the number of parameters necessary for simulation, and Dr. Kongkitkul explained that the number of parameters for plastic behavior can be alternate. The last presentation was 'Numerical methods for estimating seismic retrofit effect of SG-Wall method' by Dr. Ye. SG-Wall is a new idea of the geogrid application for quay walls, and he showed the results of both the Newmark-type sliding model and FEM. There were questions about the construction scheme and design method of SG-Walls; however, the details of the SG-Wall method are still in a research phase. Before the closing of the session, the chairman, Prof. Rao, emphasized the importance of further researches on FE modeling for reinforced slopes and walls. There were six oral presentations in this session. Most of them performed results of soil reinforcement testing. All the presentations are very briefly summarised due to a very limited space. Patias et al. (2006) showed evaluation of mechanical behavior of a Brazilian marginal soil for reinforced soil structures. Unconsolidated-undrained and consolidated-undrained triaxial tests were carried out on unreinforced and reinforced specimens. The specimens were reinforced with inextensible and impermeable aluminium foil and extensible and permeable nonwoven geotextile as inclusions. A comparison of the results obtained for the unreinforced and reinforced cases confirmed an increase in stiffness for geotextile inclusion reinforced specimens under short and long terms analyses. For the geotextile reinforced soil, the mobilized cohesion parameter was found to increase even for higher values of strain in the two situations analyzed. Garcia et al. (2006) showed the results of tests and analyze the effect of water infiltration due to rainfall on soil-geosynthetic systems, reinforced and non-reinforced embankment. Cycles of wetting (rainfall) and drying processes were applied to the embankments. The change in pore water pressure and water content during drying and wetting processes were monitored by modified water pressure sensors attached with ceramic cup and moisture sensors, respectively. Water retention characteristic curves were measured for soil and geosynthetics. Kupec et al. (2006) performed large scale plate load testing to gain a better understanding of the behaviour of biaxial geogrids with integral junctions under concentrated loading normal to the plane of the geogrid. Tests were conducted at constant rates of deformation and under sustained loading. Uchimura & Nguyen (2006) performed triaxial specimens of reinforced sand were tested with cyclic and creep (sustained) loading, with various stiffness and amount of reinforcement. Based on the test results, the roles of reinforcement in the deformation of the reinforced soil structures are discussed. Kongkitkul & Tatsuoka (2006) performed drained plane strain compression (PSC) tests on dense Toyoura sand either unreinforced or reinforced with four types of reinforcement. Guedes. & Ehrlich (2006) presented results of laboratory full-scale studies on reinforced soil walls using geogrids. The experiments were accomplished in a new facility at COPPE/UFRJ's Geotechnical Laboratory. It was verified the importance of the induced soil stresses due to soil compaction both on reinforcements tension and wall movements and also the influence of facing and its inclination on the performance of the walls. Aydogmus, T., Alexiew, D., Klapperich, H.
Results of laboratory investigation of interface shear strength and pullout behaviour of a PVA-geogrid-reinforcement embedded in a typical cohesive soil with and without soil stabilization with 6% lime and 6% cement are presented. The investigation was conducted in a recently developed novel shear- and pullout testing device with negligible influence on results. It was found that lime and cement stabilized soil gives higher shear and pull-out resistance. Cardile, G., Gioffrè, D. & Moraci, N.
A new theoretical method is developed to evaluate the pullout resistance of extruded geogrids embedded in compacted granular soils. Formulation to account for soil dilatancy, reinforcement extensibility, reinforcement length, confining stress is discussed. Experimental validation was attempted using peak and residual resistance. Results lead to good agreement with the proposed theory, in the case of extensible reinforcement. Skin friction at peak and residual is small in comparison with bearing resistance. The proposed method is expected to evaluate pullout failure with combined vertical stress and length of reinforcement. Nernheim, A. & Meyer, N.
Development of a new, multifunctional testing device is reported in this paper to carry out to large scale static and cyclic pull-out tests. In static tests the grain size distribution, density of the soil, embedment length of geosynthetic reinforcement, and the vertical surcharge stress are identified as core parameters for maximum pull-out force. Passive earth resistance and "interlock" in front of the transverse bars are the prevailing mechanisms of load transference with grid structures. In cyclic model tests the core parameters are maximum cyclic loading level and its amplitude. Cyclic loading, applied only horizontally, showed small displacements, and failure without warning for smooth steel strips as reinforcements. Frequency in the range of 0.1 to 2.5 Hz has no influence on displacements. Analysis and experimental data show that an optimal length can be determined for traffic induced cycling loading. Tanchaisawat, T., Bergado, T., Prempramote, S., Ramana, G.V., Piyaboon, S. & Anujorn, P.
The paper presents a laboratory study of a mixture of tire chips and sands in the ratios of 30:70, 40:60 and 50:50 on the use as backfill material in reinforced structures. In soil pullout tests with two geogrids have revealed that the increased contribution of sand content increased the pull-out resistance. Watanabe, K., Tateyama, M., Uchimura, T., Yonezawa, T., & Aoki, H.
Behaviour of geogrid reinforcements embedded in cement-mixed gravel has been reported in a pullout test. Bonding strength between cement-mixed gravel and geogrid was relatively high, and pullout displacement was virtually not affected by confining pressure and or quality of cement mixed gravel. Actual factor of safety of slopes and walls with geogrids is known to be far greater in general. A large shear box with fixed upper and lower halves was used to pullout the grid placed at the center of the box filled with sand. Induced resistance results from friction between the soil and longitudinal bars, and the lateral resistance of cross bars. The resistance from the cross bars gradually drops from the front to the rear of the cross bars. A nomogram has been developed to take these effects into account. The strange scatter of results in soil/geosynthetic interface characterization observed in large size direct shear box tests is due to the variability in vertical stress application before initiation of horizontal displacement and an inadequate gap between the geotextiles and the lid of the box. These shown to be important factors that need to be maintained unchanged for repeatability of test results. Kakuda, F.M., Bueno, B.S. & Teixeira, S.H.C. Main advantages of large size direct test boxes are their capability to reproduce the physical structure of reinforced soil and the capacity of applying stress and strain levels similar to those observed at the field interaction between. They are however expensive, time consuming, use large amount of soil, and present the relative difficulty in controlling moisture content and degree of compaction during test preparation. Therefore, small-scale equipments because of easiness of test preparation can be accepted in certain circumstances if they can reproduce large scale pull-but test results. The paper evaluates the viability of using small scale pull-out apparatus to quantify the pull-out resistance of dense mesh geogrids embedded in fine grained soils. Test data obtained using this small-scale test devices were compared with results obtained from large-scale pullout tests by Teixeira, (2003). Pinho-Lopes, M., Silvano, R. & Lopes, M.L. Geosynthetic type is one important parameter on the pullout behaviour of geosynthetics. To evaluate the influence of the geosynthetics type and structure on pullout behaviour in a fine-grained soil a series of pullout tests with different types of geosynthetics was reported with a large range of values for their nominal tensile strength. Higher values of pullout resistance is likely to be due to higher contact area between the soil and the geosynthetic, in planar and continuous materials; the lower pullout resistance of the grid indicates that in fine-grained soil the passive resistance mobilized in their bearing members is not as significant as in sands. reported by LEE, W. F.
This special session was aim to promote recent research progress on seismic behaviors of geosynthetic reinforced walls. As listed below, total 6 presentations were made during the 90min program, and a 15min panel discussion were also conducted at the end of the session. The Chairpersons re-arranged the presentation sequence to start from analytical model development and to end with various full scale shaking table tests, in order to tie similar topics together. All presentations were well prepared in both content and organization. Most important, none of the speakers exceeded the time limits. The presentation covered a good range of important issues in studying seismic behaviors of GRS walls, including numerical model development, laboratory centrifuge tests and shaking table test. Among these presentations, two presentations were also the winner of the student paper competition. During the panel discussion time, a lot of dialogues were raised to deliberate important topics such as interface modeling of numerical models, scaling effect and calculation of centrifuge tests, material property determination, as well as applications of modeling result to real practice. In addition to the bountiful discussions, many supportive comments were also raised from field experts sit in audience to address some important aspects of on-going research projects. This session could be concluded as a successful session with good number of attendee and well presented and discussed presentations. 1. A study on the durability of a triple liner system - Stress and deformation analysis by finite element method by Asada, H.
2. Life time assessment of polyester based geosynthetics by Naughton, P.J. 3. Creep strains of high strength polyester geogrids measured by conventional and accelerated test methods by Hsieh, C.
4. Viscous property and time-dependent degradation of geosynthetic reinforcement by Tatsuoka, F.
5. A comparison of different techniques for determining the tensile and creep strength and creep reduction factor of a geogrid by Wrigley, N.E. 6. Opinions about creep rupture in soil reinforcement design by Segrestin, P.
7. Swing up in creep curves at high loadings of PET bars - further proof of the molecular chain change model by Voskamp, W.
8. Chemical ageing and creep analyses - influence of synergy and test specimen preparation by Vidal, D.
9. Experimental study on rheology behaviour of geogrids and numerical analysis of reinforced earth structures by visco-elasto-plasticity FEM by Luan, M.T. a. What is the rationale for creep reduction factor of 1.6? b. Can we not directly apply a creep reduction factor on the 10,000 hour strength instead of applying a factor on the index strength? c. Creep strength is expressed as a proportion of the index tensile strength. However, index strength it self is determined by applying tensile loads at strain rates ranging from 1% to 20% strain per minute as per different standards. Then how can one single reduction factor be applied? d. How do we account for construction induced damage on the creep response? e. The creep strength obtained by the Japanese method is not dependent on the life time of the structure. While all other procedures limit the creep strength based on the service life of the structure. Is it reasonable to do this? f. What is the effect of glass transition temperature on the creep data obtained from accelerated creep tests performed at high temperatures? g. Most of the procedures are developed based on tests on HDPE materials. How can these be applied to other polymeric materials? Session T-1 was titled, Airports and Roads, and featured eight presentations including case histories and research reports. The session began with a report by S.S. Bhosale of the Indian Institute of Technology, Mumbai, on the inclusion of a specially produced polyester monofilament fiber in asphaltic concrete for the purpose of reinforcement. The fiber was produced from recycled PET as a large monofilament. Polyester was chosen for resistance to heat from the asphalt and the paper presents promising results. The next paper was presented by B.V.S. Viswanadham and addressed a case history of a successful use of a polypropylene fabric in unpaved rural roads in India. The geosynthetic design was based on Giroud/Noiray. Additionally the sub base was treated with lime. L.K. Lim of Polyfelt Asia presented an airport pavement rehabilitation at Subic Bay, Philippines, using a composite fabric of a polypropylene paving fabric combined with an integral glass geogrid. M. Jamei of the Laboratoire de Génie Civil, Ecole Nationale d'Ingénieurs de Tunis presented an analysis of a design method to account for the random shapes in specifying reinforcement for roads in karst construction. Barry Christopher of Christopher Consultants represented S. Perkins of the University of Montana in presenting a paper on strain measurement in reinforced pavements which related the results to design criteria. The increase in lateral confinement of the soil and of the interface shear stress under repeated loading in the field test is shown and recalculated by FEM analyses. J. Retzlaff of Colbond presented two papers, a case history and a contribution based on large scale model tests to design analysis concerning geogrids employed to reinforce subgrades in road construction. The design procedures are divided to those based on the rutting depth and others based on the bearing capacity of the reinforced soil system. Erol Tutumluer of the Dept of Civil and Environmental Engineering at the University of Illinois presented an analysis of the benefits of geogrid reinforcement in flexible pavements on weak subgrades. The paper shows the instrumentation and results of field tests. A second paper at session R-1 (Kwon, J. & Tutumluer, E.) has to be considered. This session was opened as the planned schedule starting at 13:30 dated Sep-21-2006 with the theme of "Railway, Seismic Stability." Totally 6 papers were presented as bellows and 5 speakers except W.F. Lee who had never shown up during the entire session gave their presentations followed by vigorous questions and answers for the given 90 minutes. 2. Set up of a warning system integrated inside a reinforced geotextile for the survey of railway by Braincon, L., Nacey, A., Robinet, A. and Voet, M.
3. Rapid restoration for a seriously damaged railway embankment during violent earthquakes by Kitamoto, Y., Abe, H., Shimomura, H., Morishima, H. and Taniguchi, Y. 4. Seismic design of geogrid reinforced soil embankment - Standard design of new Shinkansen railway - by Yonezawa, T., Aoki, H., Horii, K., Tokita, Y. and Tateyama, M.
5. Reducing seismic displacement of gravity-type highway bridge abutments using soil reinforcement by Huang, C. C., Chen, F. C. and Wu, H. J. 6. 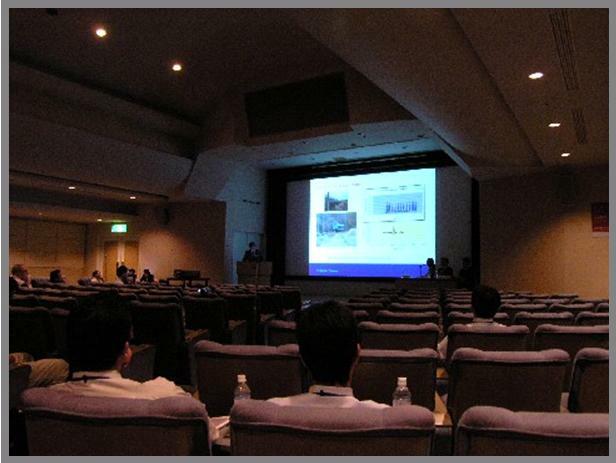 Shake table tests for caisson-type quay walls retrofitted by geogrids by Ichi-I, K., Suzuki, Y., Hironaka, J., Terakawa, H. Shigehisa, S. and Fukuda, M.
At first, Mr. Nancey from Bidim Geosynthetics, France, gave a talk about a warning system integrated inside a reinforced geotextile for the survey of railway which crossed the risky area where some cavities had been identified beneath the railway in the west of France. He introduced the warning system employing the optic fiber for possible cavity-induced subsidence as well as the reinforcing effect of geotextile laid under the ballast of the railway. Four questions were given to him including how much the maximum capacity of the optic fiber was, how the optic fiber was managed where it was stretched under the compaction loads during the installation of the fiber and geotextile, which kind of geotextile was used, and how many points could measure the strains along the fiber. Secondly Dr. Kitamoto Kajima Corporation in Japan introduced a case of remedial work employing the ground anchors and high-strength vinyon geogrids for the railway embankment damaged during Juetsu Earthquake in Japan. He demonstrated an example of successful application of geosynthetics to the quite fast remedy for the damaged embankment. Thirdly Mr. Yonezawa from Japan Railway Construction, Transport and Technology Agency gave a presentation to address the enhancement of earthquake resistance of embankment for railway track on which the Japanese bullet train, so-called "Shinkansen," would be running by the employment of geogrids reinforced earth. He explained the estimation for stability of the reinforced railway embankment using the Newmark sliding block method and suggested the pattern for arrangement of geogrids. Two questions were asked to this presentation saying how the reinforcement was installed near the slope surface of embankment, namely wrapped or flattened, and which numerical model was adopted for the calculation of settlement of embankment. Fourthly Prof. Huang from Chi Nan University in Taiwan had talked about reduction of seismic displacement of a bridge abutment on the highway in Taiwan using soil reinforcement. He explained the experimental and analytical evaluation of seismic displacement of the abutment according to the updated seismic code in Taiwan. He was asked how much the vertical seismic coefficient affected the calculation of settlement of the abutment, what gave 2500 years to the return period of huge earthquake in eh calculation, and what the calculation was based on. The validity of his calculation for the horizontal displacement of abutment was asked as well. Fifthly Prof. Ichi-I from Hiroshima University in Japan introduced the shaking table test for caisson-type quay wall retrofitted by geogrids which was seen to enable reduction of horizontal displacement under seismic loads during the test. He made a note of formation of reinforced wall even under a water surface by the use of geogrids and cement-treated dredged soil. Given to this study were several questions and comments including the validity of its construction procedure, similitude rule on the rigidity of the quay wall and reinforcement, and connectors between the reinforcements and the body of quay wall. Finally, after all the presentations had been finished, the chairman made a closing statement for the session and every participant responded with a round of applause. The writer likes to sincerely acknowledge the patience and efforts of five speakers and all participants including chairpersons to the successful presentations and valuable discussions in the Session T-2. There were eight oral presentations in this session. Most of them focused on the uses, designs, researches and newly developed construction techniques of geotextile layers laid on pile foundation on soft soil deposits. All the presentations are very briefly summarised due to a very limited space. Brokemper et al. (2006) showed the use of geotextile encased columns (GEC) to reduce the settlements as well as to improve the global stability of the embankments. They presented that GECs function as friction and end-bearing pile foundation that allows further settlement and water to drain for settlement acceleration during construction. Corbet et al. (2006) proposed a soft soil improvement method by using Controlled Modulus Columns (CMCs). That is, the loads from the new embankments were transferred to the CMC's through a geotextile reinforced load transfer platform. They also presented the use of 1 m-high geocell mattress in a landfill site. Klapperich & Aydogmus (2006) showed their interests on the interaction behaviour between cohesive soil and geogrid. They showed the test results from direct shear test with and without a layer of geogrid and pullout test, using backfills which were untreated or treated by cement or lime. Both cement- and lime-treated cohesive soils showed the maximum ratio of shear stress and normal stress greater than 1.0 in both shear and pullout modes. Chew et al. (2006) performed heavily instrumented model tests on piles coupled with geotextile reinforcement to support the embankment. They showed that the model embankment cannot achieve stability without the use of geotextile reinforcement laid on the top of piles. They reported that a minimum fill height is required to ensure that soil arching can develop before the soil subsidence takes place. van der Stoel et al. (2006) reported the use of "high speed piles (HSP)" for the construction of railway embankment. The settlement and construction time can be respectively minimised and reduced by using HSPs. The railway embankment then was constructed on the geogrid-reinforced mattress. They reported that the load carrying system was activated at small geogrid strains, leading to extremely small deformations and high durability. Marchi et al. (2006) reported the use of piled embankment technique on the constructions of railway and highway. In these constructions, the geogrids performance was optimised by removing the requirement for costly pile caps. That is, the high tensile polyester geogrid was installed with a thin layer of sand separating the geogrid and the pile top. Blume et al. (2006) showed the construction of a high-strength geosynthetic-reinforced embankment on soft soils. The embankment was reinforced by two layers of a geotextile arranged at 0.5 m vertical space instead of using only one layer having the double tensile strength. They showed that the measured tensile strain at the bottom layer of geotextile was substantially larger than the one of the upper layer. Therefore, they concluded that using two layers of relatively weaker reinforcement instead of one single layer of relatively stronger reinforcement is not optimal and risky. Phoon et al. (2006) reported field behaviours of an instrumented geotextile reinforced piled-embankment (GRPE) for an expressway. The monitored soil stresses at various locations show the presence of soil arching effect in the embankment fill. By using GRPE system, the settlement was reduced and the differential settlement was minimised. Despite missing a few invited presenters, the "T-4: Reinforced Walls" session treated attendees to a wide-ranging, satisfying discussion. The presenters took the audience into the lab and into the field. Papers analyzed the soils beneath walls and the soils behind them. The presenters discussed design, installation, general practice and future research needs. New walls were discussed. Failures were discussed. One project even featured the need to make new walls look historical, thus giving an old face to what was behind the scenes a thoroughly modern design. Reinforced earth structures on soft alluvial deposits improved with prefabricated vertical drains and stabilizing berms." Presenter: Mr. Somnath Biswas, Reinforced Earth India Pty Ltd., India. Co-author: Atanu Adhikari, India. Mr. Adhikari attended the session as well. Application of strain gauges to measure nonwoven geotextile deformation in reinforced soil walls." Presenter: Prof. Myoung-Soo Won, Chonbuk National University, Korea. Co-author: Prof. You-Seong Kim, Chonbuk National University, Korea. Prof. Kim attended the conference. Design and performance of an 11-m high block-faced geogrid wall." Presenter: Prof. Richard J. Bathurst, GeoEngineering Centre, Queen's Royal Military College, Canada. Co-author: Tony Allen, Washington State Department of Transportation, USA. Enhancing internal stability of reinforced soil slopes with anchors." Presenter: Dr. Shuqiang Gui, China University of Geosciences, China. Co-authors: Prof. A. Aydin, University of Hong Kong; and W. Liu and Z.J. Dai of Etsong Geogrids Ltd., China. A complex segmental concrete block retaining wall structure for the reconstruction of a historical bridge." Presenter: Mr. Pietro Rimoldi, World Tech Engineering Srl, Italy. Co-author: Elena Manni, Province of Modena Adminstration, Italy. Prof. Huang opened with a five-minute introduction that prepared the audience for the key points in the session. Afterwards, he allowed each presenter 10 minutes plus 3 minutes for Q & A with the audience, though the audience was determined to run beyond those 3 minutes per paper. The discussion was engaging. Still, Prof. Huang kept the session on time. With the final paper, the session was allowed to run to the end of time. And with the audience's permission, Prof. Huang issued his closing remarks at one minute past the session's posted conclusion, the co-chair read an IGS announcement, and the session was closed. An additional note: the Small Auditorium's space was comfortable for all and the staff members who assisted with audio-visual help were more than courteous. Dr. Yoshida's assistance as secretary was also greatly appreciated. It was, all in all, a well-received, successful session. Technical Session W-2 on "Liners on Slopes" (TS-W2) has been jointly organized by IGS (International Geosynthetic Society) and ISSMGE (International Society for Soil Mechanics and Geotechnical Engineering) through its Technical Committee #5 (TC5) on "Environmental Geotechnics". The common joined activities between IGS and ISSMGE officially began in Cardiff (2006) with two other Technical Sessions on "Remediation" and "Testing & Materials" as part of the 5th International Conference on Environmental Geotechnics (5ICEG). Cooperation between ISSMGE and IGS will continue in the near future within the framework of the Federation of International Geo-engineering Societies (FIGS) which also includes the International Association of Engineering Geology and the Environment (IAEG) and the International Society for Rock Mechanics (ISRM). The scientific and technical contents of the ten papers included in the TS-W2 are very interesting. Eight papers have been orally presented, while the remaining two were presented in the poster session. - General design problems related to the use of geosynthetics on landfill slopes. Referring to the first group of papers it is appropriate to mention the two works by Fowmes et al. and Li & Imaizumi which dealt with the numerical modelling of the interaction between the waste body, geomembranes and slopes at different inclinations. The Authors of the first paper try, rather successfully, to model a real failure in tension of a geomembrane on a very steep and stepped slope of a quarry landfill. The theoretical model of the second paper was also corroborated through a series of centrifuge tests on small scale physical models with slopes at different inclinations. Apart from the mechanical behaviour of the different kinds of geosynthetics and the influence of the slope inclinations on the lining profile performances, the discussion on these two papers highlighted the great importance of the mechanical behaviour of the waste body on the stress level induced by the interaction with the geomembrane. The paper by Girard et al. describes a series of experimental tests on anchorage trenches at the top of the slope pointing out, in the conclusions, that the optimisation of the trench shape in terms of pull-out resistance is still largely empirical and, therefore, further studies are necessary to try to theoretically clarify this topic. An improved methodology for geomembrane wind uplift design was proposed by Giroud et al.. This methodology offers a practical and effective tool to check anchorage and geomembrane resistance and allows to decouple the anchorage design from the definition of the geomembrane type and the related stress-strain behaviour. Nakamura et al., in their paper, describe an interesting technology based on an optical fibre sensor to measure the geomembrane deformation. The system was applied to measure geomembrane movements due to seasonal changes in the weather conditions. The discussion from the floor pointed out that the main limitation of this technology is the too-low deformation amplitude that can be practically assessed. It is possible to include the two papers by Cowland et al. in the group of papers dealing with general design problems related to geosynthetics use on landfill slopes. The papers describe the main design considerations and the final solutions adopted in order to line quarry landfills characterized by very steep slopes. The Authors experience explained in the papers can be considered a very interesting source of information for other designers who often have to cope with these kinds of difficult conditions for geomembrane emplacement and protection from mechanical damage. Another very interesting paper, dealing with underwater lining system design and construction for a coastal waste disposal in the Japanese inland sea, has been presented by Kotake et al.. The paper is interesting in particular where it describes the lining profiles and the construction procedures. Some information is also given about the stability analyses of the underwater lined slopes of the deposit. Summing up the main contents of the TS-W2 papers, the following considerations can be made. The use of Geosynthetics has been confirmed to be a very useful tool for effective and convenient solutions for landfill lining systems under difficult conditions but their design is still mainly based on empirical approaches rather than on a strong theoretical basis and engineering rationale. Resistance and deformability under tension stresses of geomembranes on slopes and the related pullout resistance of the anchorage trenches are still the main problems for the designers. In particular, the progressive failure of the anchorage trenches and the waste body-lining system interaction need further investigations in order to set up rationale and reliable design procedures that could be applied to most of the conditions that occur today in landfill projects. (1) "Analysis of technical criteria for clay liner in China" written by Tang, X.W., Chen, Y.M., Luo, X. & Ying, F. explained the clay liner being required as landfill standard in China, and some basic factors, such as (i) hydraulic conductivity and (ii) the thickness, were proposed as the control index for landfill liner. (2) "Numerical analysis of transport of landfill leachate through layered system underlain by an unsaturated soil stratum considering nonlinear sorption and degradation" by Zhang, J., Luan, M. & Yang, Q. presented that numerical simulations were made in order to investigate the effects of the degree of saturation on the migration of landfill pollutants through unsaturated soil layer. (3) "Experimental investigation of flow rates through composite liners at the metric scale" written by Touze-Foltz, N., Barroso, M. & Cartaud, F. reported that a significant large amount of flow was obtained, in the case of geotextile, compared to the case of CCL/GCL soil liner. (4) "Behaviour of an upstream stack formed with geotextile wrapped dikes" by Costa Filho, L.M., Pedrosa, S.B.M., Sieira, A.C.C.F. & Silva, M.R.P. proposed the extensive use of geotextile wrapped dikes on a previously operated Residue Disposal Area (RDA) being highly satisfactory from the operational, economical and environmental points of view. (5) "An example on the construction of MSW landfill site with the leakage detection and restoring automatically" written by Murakami, Y., Kobayashi, F., Shimomura, Y., Nakao, T. & Shimonishi, S. introduced the leakage detecting and defect restoring system developed in Japan, and its performance was fairly good in the real field. (6) "Use of geocomposite strips in leachate collection systems" by Zhao, A. & Giroud, J.P examined the leachate collection systems using high-transmissivity geocomposite strips, and a design method was partly proposed. (7) "Geosynthetic drain elements for landfill cappings: long-term water flow capacity and long-term shear strength" written by Mueller, W. described a testing guideline for suitability proof of geosynthetic or geocomposite drain elements for final landfill capping system based on (i) the long-term in-plane water flow capacity, (ii) the long term shear test, and (iii) the calculation of drainage lengths. (8) "Portable methods of locating leaks in liners and their integration" by Peggs, I.D. proposed various kinds of method for the detection of leaks in geomembrane liners, and the applicability and effectiveness of monitoring system were evaluated. (9) "Evaluation of the real performance of an electrical geomembranes leak detection system : full scale experimental study" written by Caquel, F., Villon, G., Florin, J.P. & Marcotte, M. showed the leak location testing using electrical methods currently being used in liner CQA, and the electrical detection system had relatively good reliability and its accuracy allowed the detection of holes approximately 2 mm and smaller. (10) "Drainage performance of composite geotextiles under confined loads" by Jeon, H-Y. & Jacek, M. evaluated (i) variation of thickness, (ii) in-plane permeability, and (iii) transmissivity with compressive stress of smart geotextiles by comparison with geonet composites. (11) "A case study of the use of large-diameter high-density polyethylene geopipes" written by Sumiyama, Y. & Tashiro, K. explained the development of large-diameter polyethylene geo-pipe, and its performance as a drainage pipe was successful due to its (i) lightweight, (ii) high chemical resistance, (iii) high wear resistance, and (iv) high water tightness. Finally, I would like to leave the following thought: (1) The efficiency of proposed liner and monitoring system was the focused interests. We may need to further study about the maintenance of monitoring system after the intensive use of the facilities. (2) In the case of portable monitoring system, the method has been proposed to be relatively fine for understanding the damage level. We may need to define how effective it is, and which method would be the best in some real case. Thank you. The chairman introduced the co-chairman and secretary and then outlined the contents of the papers to be presented. The co-chairman then took over and introduced the individual speakers. Paper 1: Ageing resistance of HDPE-geomembranes - Evaluation of long term behaviour under consideration of project experiences by Tamowski C., Baldauf S.
Paper 2: Durability evaluation of geomembrane liners by outdoor exposure experiments for 10 years by Harada T., Imaizumi S., Nishizaki I. - Dr Greenwood: if the accelerated and real-time results are based on the respective radiant exposures (ultraviolet doses) instead of time do they give the same result? Paper 3: The study of the durability about the triple liner system - The loading tests about slope hydraulic barrier function on the sea are landfill sites by Satoh T., Akai T., Ishida M., Nomura T., Kamon M.
Paper 4: Non-destructive test for geomembranes by visible near-infrared spectroscopy by Komiya T., Nakayama H., Shimaoka T., Inoue K.
- Mr Komiya: It is basically a surface effect although studies have been done of the state of the geomembrane at all depths. Paper 5: Relationship between temperature and peel strength of double hot wedge HDPE by Lopes G., Barroso M., Costa C.
- Prof. Lopes: Testing will be performed in the laboratory and a correction can be made should the temperature differ from the standard. Paper 6: Estimate of thermal stress of geomembrane using a thermal infrared imaging device by Nakayama H., Shimaoka T., Komiya T., Sannou T.
- Dr Greenwood: Figure 1 in your paper refers to measurements made on a simple slope. What is the reasons for the poor agreement between measured and calculated values? Paper 7: Bituminous geomembrane in extremely cold conditions by Bruel B., Reinson J., Elridge T., Stenson G., Herman A. - Dr Peggs: Would you know if your liner leaked? What were the real cost savings? Paper 8: Implementation of HDPE geomembrane and geotextile liner: A Case histoty from Baku-Tbilisi-Ceyhan (TBC) crude oil pipeline storage tank farm Ceyhan Marine Terminal by Kaya E., Gueler E.
- Dr Greenwood: Does the liner swell in the presence of crude oil, as occurs with the lighter hydrocarbons? - Mr Kamura to Mr Baldauf: How well is the carbon black dispersed - on the nanoscale?